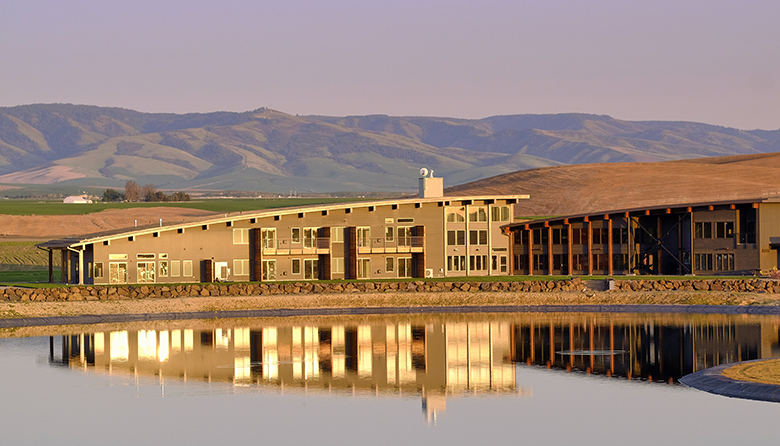 I’ve stayed at all sorts of places in Walla Walla wine country… from the historic Marcus Whitman Hotel to the adorable Green Gables Inn, but I think I’ve found my ultimate happy place at the sleek, high-end Eritage Resort (1319 Bergevin Springs Road; 509.394.9200; rates vary but average around $350/night) which opened this summer after a number of delays. Half of the 10 ultra-comfy suites on the 300-acre property -- think luxe king beds, a plush couch with a fireplace view and a dreamy armchair/ottoman combo -- look out on rolling vineyards. The others enjoy a view of nearby wheat fields and the Blue Mountains in the distance. The handsome structure was designed to seamlessly blend into the landscape, its gracefully curving roofline and chocolate-colored exterior coming off as subdued at first glance. Cue the spectacular fall sunset, and as I sipped a glass of Sleight of Hand wine, the building was bathed in shades of glorious shades of gold. Very cool. This much-buzzed about project is a collaboration between Walla Walla vintner, Justin Wylie (Va Piano) who owns the land and Seattle-based Fire & Vine Hospitality, the group behind El Gaucho, Aqua, The Lake House, Miller’s Guild in the Seattle area. It’s also behind the hotly anticipated Walla Walla Steak Co. and Crossbuck Brewing, both set to open in November in Walla Walla’s renovated train depot, with former Seattle chef Dan Thiessen at the helm in the kitchen as a managing partner, working with the legendary Paul Mackay. Eritage also has a restaurant and bar, where chef Brian Price and his team work with Fire & Vine’s culinary director, Jason Wilson, to focus the seasonal menu on Walla Walla ingredients including produce from Frog Hollow Farms and Hayshaker Farm. They’ve also got an ambitious in-house charcuterie program. Dinner was outstanding, especially the braised and grilled octopus starter, and the roast halibut served with bacon-razor clam chowder and a marrow bone salad. But the dazzling meal was slightly overshadowed by the star power in the room including Leonetti Cellar founder Gary Figgins and his wife, Nancy, dining with Walla Walla Vintners’ Myles Anderson, as well as Sleight of Hand’s Trey Busch and Justin Wylie. Eritage is a 10-minute drive from downtown Walla Walla, so if you’re planning on heading that direction to do some wine tasting—there are numerous tasting rooms in town--you might want to arrange for transportation. Or, you could just chill while sitting around the outdoor saltwater pool (closing soon for the winter), hit the manmade lake on a standup paddleboard or hang out by the outdoor firepit. It’s all very peaceful, but here’s an essential heads up: There are more cottages under construction, set to be open in 2019, so your wake-up call might involve the sounds of hammers pounding nails if you stay there Sunday through Wednesday. But as long as you’re up, head into the breakfast buffet, which includes DIY mimosas, pastries and mini frittatas.